Five lions and nine tigers from two different circuses have been rescued from their bare board cages and have taken their first steps on grass. For the whole of their circus lives, the circus animals had only ventured out of their bare board cages to perform tricks under the big top. That was to change forever when Guatemala’s ban on animal circus acts came into force, and Animal Defenders International (ADI) embarked on a mission to enforce the law. ADI’s first task was to set up a temporary rescue centre from scratch, where animals removed from the circuses could be cared for until relocation to their forever homes. ADI then negotiated the handover of the animals: three lions from one circus, two lions and nine tigers from another. Since their arrival at the centre, ADI’s experienced team has built exercise enclosures for the animals, with fresh grass and enrichment such as swinging tires and big hay bags filled with catnip. The most space the big cats have ever known, the play areas are vital for keeping the animals entertained and healthy, building their muscles, and improving their coordination. Free to be themselves, the lions’ characters began to emerge. It is expected to take months to complete the necessary health checks and documentation needed to take the animals to their forever homes. For the lions, this will be a new 450+ acre sanctuary ADI is building in South Africa, with the support of Joanna Lumley and Ed Asner. The tigers have been offered permanent homes at US tiger sanctuaries Big Cat Rescue and Tigers for Tomorrow. As with many of the animals ADI has rescued from circuses, a number of the big cats have been mutilated to remove their claws and at least two of the animals need treatment to repair damaged teeth. ADI is seeking funds to care for and treat the animals until they are ready to go to their forever homes. 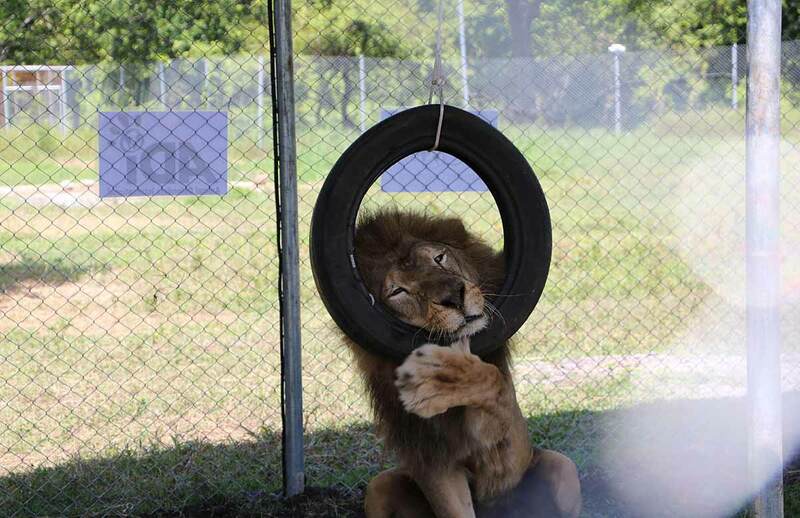 The organisation plans to help the remaining circus animals in Guatemala. Two circuses with 18 tigers, 2 more lions, 2 pumas, a camel, 2 spider monkeys, and a porcupine are defying the law, and the Guatemalan wildlife department (CONAP) is working through the court to seize them.